This year’s Discovery Trail Challenge: Devon Taster, a walk along the Devon side of the Tamar Valley Area of Outstanding Natural Beauty’s long-distance route, will take place on Saturday 6thOctober and will raise funds for Tamar Tender Loving Care (TLC). Tamar TLC is a charity that raises & distributes funds for the benefit of the Tamar Valley AONB. Alex Midlen, Chair of Tamar TLC says, “Tamar TLC was established in 2016, and we launched our Visitor Gifting scheme last summer. Over the past year, we have worked with a number of local businesses to raise money through donation boxes, which is working well. We want to be able to give even more back to help conserve and enhance the landscape, so we are delighted that the Tamar Valley AONB has chosen us for their charity this year. We hope to raise £5,000”. Coralie Barrow, Development Officer for the Tamar Valley AONB, says, “This Devon Tasteris the first in a series of three Discovery Trail Challenge events to raise money for Tamar TLC. This year’s route provides a great opportunity to explore the Devon side of the Tamar Valley, with its hidden views and fantastic scenery”. Coralie continues: “The Discovery Trail is one of the most varied and rewarding routes to walk in the South West. Many people enjoy walking smaller sections of the Trail, but longer routes can seem daunting if venturing out alone. This organised walk offers people the chance to walk a large section of the Trail, knowing that there is help or refreshment close by”. 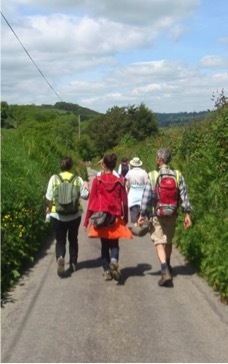 Two options are available for walkers on this year’s Discovery Trail Challenge: Devon Taster; a 17-mile route starting from Tamerton Foliot, or an 11.5-mile route beginning in Bere Ferrers. Both routes will end at the Tamar Trails Centre, Gulworthy, where transport will be provided back to Tamerton Foliot or Gunnislake Station to catch the train to Bere Ferrers. Along the trail there will be free water top-ups, a pasty lunch (courtesy of Ginsters), cup of tea, experienced medical cover and regular check-in points staffed by marshals. Each walker will also receive a certificate and goody bag, from the Tamar Valley AONB. The cost to sign up for the Discovery Trail Challenge: Devon Tasteris £20 per person, but the Tamar Valley AONB team is offering an early-bird special of just £15 for those signing-up before Monday 24th September. If you’d like to enter a team (3-6 people), the entrance fee is £40 for the team. For little legs, a children’s trail is also planned. The three-mile Tamar Trail’s Questwill be nature-related, where walkers must find eight stamps in hidden boxes along the way. Cost: £4 per child (accompanying adults free). £3 per child for groups of three children or more.